And that will be that. The whistle goes on a very average Sunderland display but Southampton and those fans who have taken on a 750 mile round trip won't give a hoot. Dusan Tadic's penalty the difference. Why, oh why did Yann M'Vila dive in on Ryan Bertrand to concede it. Sam Allardyce will despair. The away side are now playing with a back five as Jermain Defoe is again the target. Headed away by Jose Fonte and James Ward-Prowse will head for the corner flag. This is tame from Sunderland. They just cannot muster anything of meaning. Long balls, flicked on looking for Jermain Defoe are as inventive as they get but Southampton have Defoe shackled. In comes the corner and Sunderland fans appeal for handball but there's nothing doing. They need a final surge here. Jack Rodwell's header did strike the back of Maya Yoshida's arm but it was ball to hand and his arms were tucked by his side as he tried to block. It would have been harsh. Southampton introduce Juanmi for Sadio Mane for the final exchanges. James Ward-Prowse blasts over from 20 yards. 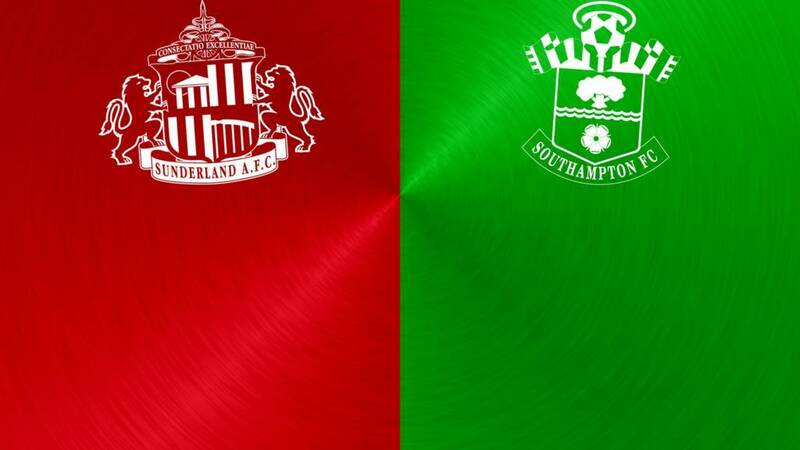 This would extend their unbeaten run to six games in the league but Sunderland force a corner. There's frustration and an air of acceptance washing over this stadium. The home side can't land a glove of meaning on Southampton at the moment and time ticks away. A long ball finds Duncan Watmore willing to run but not even Red Rum could catch that. Jordi Gomez jogs off and high-fives Sam Allardyce as Jermain Defoe comes on. A swift response from the home side as Adam Johnson fizzes a volley, forcing Maarten Stekelenburg into his first meaningful save - a parry at the near post. Johnson stands over a free-kick now and will swerve it left-footed, just too high. Jermain Defoe will be with us shortly. "Daft of M'Vila to slide in, but I don't think there was contact. I have seen those given though, and Sunderland can't have a complaint." Sunderland, deary, deary me. Sam Allardyce has every right to look gutted by that tackle from Yann M'Vila. The midfielder slid in when Ryan Bertrand was going nowhere. Allardyce put his head in his hands and in the meantime, Dusan Tadic stepped up and whipped the ball left footed across his body into the corner, out of the reach of Costel Pantilimon. Southampton deserve it, it's been coming for 10 minutes. Yann M'Vila dives in on Ryan Bertrand and Southampton have a penalty. Sam Allardyce looks absolutely fuming. Another Sunderland attack ends near the halfway line and there are some moans of frustration from the home fans. You almost wonder is Southampton should take some risks here and not send as many men back when the home side attack. There's little confidence in the Sunderland team going forward it seems. After that flurry of activity it's beginning to open up a bit and Southampton will probably be more at ease with that situation. They continue to have better possession and territory and just look a lot more threatening generally. The away side look capable of carving a chance where Sunderland look like any breakthrough will come from brute force. Hang on a minute, we have a game on our hands all of a sudden. Where did this come from? Duncan Watmore has a glorious chance 12 yards from goal as a ball ricochets into his path but he shoots tamely into the hands of the goalkeeper. He looks almost sheepish. Will he be brutally punished as the ball comes into the Sunderland box... Steven Davis shoots... off the line by Sebastian Coates. A brave clearance on the goal line by DeAndre Yedlin as he marks the back post and heads Jose Fonte's glancing header away. The defender had to stoop on the line and he gets caught by the follow through of a Southampton attacker. On comes the physio. Brave. Needed. Crucial. Graziano Pelle looks frustrated as he has a volley blocked by Billy Jones eight yards out. Sunderland made their own problems as Younes Kaboul only headed a clearance to the edge of the 18 yard box, allowing Sadio Mane to shoot before Pelle tried to take up the rebound. Sadio Mane advances centrally and shoots from 25 yards, Costel Pantilimon fumbles the zippy shot out into his box. Southampton recycle the ball and Graziano Pelle heads down for Mane, he tries to spin in the six yard box but gets no connection. Ryan Bertrand advances down the left and wins a corner for the visitors but their training-ground set piece comes to nothing and ends up back with their goalkeeper. The ball is briefly like a pinball in midfield. Only for a 10-minute spell in the opening half did this game have much of a pattern when Southampton took control. It's just been a bit slap-dash since. A look at the average positions Sunderland occupied in their 6-2 loss at Everton (left) and in the opening half today (right). It looks like a clear tactical change. Last week's back three has gone, instead today we see a back four with Billy Jones (21) pushed on at left-back. Their midfield four is compact in the absence of Lee Cattermole. Still, it's strange that Southampton's Jordy Clasie has had so much ball centrally when it should, in theory, be tight for him. I was maybe a little harsh on Ola Toivonen. The man taken off at half-time touched the ball 26 times, playing 19 passes and completing 73%. Sunderland have worse performers. Sorry Ola. We are under way and the rain is falling at the Stadium of Light. Slick surface, is there a goal in this? I fancy just one. It looks like Fabio Borini is ready to come on for Sunderland. He's stripped into his kit and on the touchline. He replaces Ola Toivonen who did not have a great half. Most of Sunderland's attacks have been focused down the left flank where they've utilised full-back Billy Jones high up the field a few times. For each side, their central midfielder is proving key. Jordy Clasie has seen most of the ball for Southampton with 58 touches and an 89% pass completion. Yann M'Vila is Sunderland's go-to man, with 38 touches and a 71% pass accuracy. Far from vintage, but no denying who is on top. A long ball over the top releases Duncan Watmore - he gallops into a wide area and will try to cut into the area but back comes Jose Fonte and no nonsense, he slams the ball clear. That's it, the final action of an ordinary first half. Adam Johnson. No complaints. Tugged back Sadio Mane as Sunderland looked to break. Ryan Bertrand exerts too much pressure on Steven Fletcher and this free-kick gives Sunderland the chance to load the box. In comes the delivery but Younes Kaboul only knocks it down to a greens shirt. In it comes again, Fletcher pulls the ball down but Virgil van Dijk blocks fantastically six yards out. Sam Allardyce is scratching his chin as he stands on the touchline. His side did offer up a couple of early chances and are now looking solid enough. Jordy Clasie can only thump a ball through their defence to the goalkeeper. He looks annoyed with himself. Virgil van Dijk with an interception at the back for Southampton, away they come, Dusan Tadic crosses, big header from Younes Kaboul. As we enter the final 10 minutes of the half it's hard to tell if Sam Allardyce will be happy or annoyed. His team have seen little of the ball - just 126 passes to 235 by Southampton. But they are at least keeping a clean sheet and don't look as ragged as during the second half of their hammering at Everton last Sunday. Billy Jones has played very high up the field on the left for Sunderland and is flagged offside from a cross-field pass. WHEYYY. Go the away supporters, even some of the home fans join in. Why? Ola Toivonen has just had one of the worst shots you will see all season. He lets rip from 30 yards and his effort skews high to land around five feet from the corner flag. Jordy Clasie is the man Southampton look to to start attacks and tick them along in the engine room. He has more touches than anyone on the field - 35 - after half an hour. Sunderland would be wise to get on top of him sooner rather than later. James Ward-Prowse swings in a free-kick for Southampton but Younes Kaboul heads away with authority. Somehow Sunderland need to string some passes together and break this away momentum. Confirmation of the fact Southampton are in control here. They are having the better of possession by some margin and territoriality they are on top too. Costel Pantilimon is the only player keeping Sunderland level here and that will be a major worry for Sam Allarydyce. The keeper throws himself to his right as Sadio Mane pulls off a snap-shot from 16 yards. It's a great diving parry with the ball travelling quickly into the corner of the net. A nice height for the keeper but still, top stuff. A look at how that Tadic opening was constructed. Some good work by Southampton and the number 11 was slid in by Graziano Pelle but could not execute a fitting finish. Dusan Tadic has just had the best chance of the early stages. He senses Graziano Pelle may showcase his excellent hold-up play and he does. The big Italian holds off a defender and slides a pass back to Tadic who can run into the area for a one-on-one chance with Costel Pantilimon. LIFT IT... he doesn't and the big keeper gets down to block with his legs. Tadic is known as an assist king. He has to be gobbling up those chances to add to the goal tally though. Neat and patient by Sunderland as Yann M'Vila wins the ball smartly in midfield and some tidy build-up allows Billy Jones to cross into the hands of the goalkeeper. That was smart by M'Vila though, they need him to be a presence in the absence of the injured Lee Cattermole. Sadio Mane is having a busy few minutes as he gets the game's first yellow card for a poor slide tackle on Billy Jones. It was late, the ball had gone. Mane was sent off as recently as 25 October of course in a draw at Liverpool. Southampton attack down the left flank and Dusan Tadic will get his chance to pick out a cross, he goes back post... SADIO MANE... what a chance. He;s unmarked at the back post with the chance to volley from 10 yards out but he misfires and the ball threatens the corner flag. As the play settles a little Jordy Clasie tries to up the ante with a blast from 35 yards. It was travelling at some speed but is a few feet too high and Costel Pantilimon doesn't even dive. These home fans are loving the sight of Duncan Watmore getting a chance. The 21-year-old sets off on a run from the halfway line and batters his way towards the corner flag to win a corner. "GO ON," can be heard from the home fans. Watmore looks bang up for this and if he can transmit his enthusiasm to the rest of his teammates they could be in business. The corner he wins is cleared but Sam Allardyce will like the start his team have made. "Pelle works very hard, but he has good players alongside him. He has the likes of Tadic, who is clever, and Mane who has pace, the three of them have been fantastic." Sadio Mane slips his man in the final third and he weaves space down the right flank to open up a good crossing opportunity. Can he deliver... he can... no one arriving on cue. The home side get us under way and it's a good start as they pump a ball forward and immediately win a corner. Younes Kaboul leaps to head at goal but it's a tame looping effort. A feisty opening by the home side. "Southampton have been phenomenal, as has their pre-season recruitment. "The beauty of teams like the Saints, and Swansea as well to an extent, is that they have a way of playing as a team and they then source players who can fit in. There therefore should be no period where the player needs to work to fit in." "Sunderland, Sunderland, Sunderland," bellow the home faithful. "Sunderland have spent a lot of money, and for what they have laid out, in terms of return, what they have achieved in the league has not been good. A lot of that comes down to recruitment and the types of players who are playing at the Stadium of Light." As the players line up, Colour Sergeant Chris Hunter marches into the centre of the field to lay a poppy wreath in a moment of remembrance. "It was never going to be easy to improve another manager's ailing team without the ability to freshen things up with new signings. "But Sam Allardyce knew the challenge he was taking on and has done what he can to make Sunderland more positive. Five goals in his first three games in charge is a marked improvement but defensively there is still much to do. "Southampton arrive unbeaten on their travels and in their best form of the season. Hardly the ideal opposition as Allardyce continues to assess his players. A sobering thought that there are another eight matches before the January transfer window opens." The players line up in the tunnel. Younes Kaboul, back from injury, stands hands on hips as captain of Sunderland. A smile on his face, he gives one more shout of encouragement before striding forward as the players march out of the tunnel. It would appear Southampton take their dress code very seriously as images of the players arriving at the Stadium of Light show even the wire powering their headphones must match. You look good lads. Southampton manager Ronald Koeman is well aware he may see a backlash from Sunderland after their collapse at Everton last Sunday. He adds: "They play at home, they need points and for them it's a difficult situation and that's sometimes for an opponent a dangerous one." The players (even Duncan Watmore) have left the turf and will be getting those crucial final instructions now. This, after last week's shambles, is a real test of a fixture for Sunderland. Under Sam Allardyce they seem to have grasped the concept of scoring goals but at the other end they have the resistance of a Rich Tea biscuit being dunked in hot coffee. This is nice to see, it seems Duncan Watmore has been soaking things up on the turf on his own. If you look closely at Sunderland's tweet, he's near the halfway line. A big day. It's a first Premier League start then for 21-year-old Duncan Watmore. The forward has managed one goal in four substitute appearances for the Black Cats in the league so far. Did you know? Watmore started his football life at Manchester United and left at the age of 12. He joined Altrincham and rattled in 14 goals in the 2012-13 season before moving to the north-east club. Sunderland make four changes from their hammering at Everton last Sunday. It would appear Sam Allardyce is going to try a back four but West Brown is replaced by Younes Kaboul. Elsewhere, Jordi Gomez is in for Lee Cattermole while Duncan Watmore and Ola Toivonen come in. Just the two changes for Southampton from their 2-0 win over Bournemouth. Victor Wanyama is suspended James Ward-Prowse comes in. Maya Yoshida is in for Cedric at full-back. If you're a Southampton fan who has made the long trip today please send me a selfie to #bbcfootball. It's a mammoth 326 miles one-way via road, so over 750 miles there and back which is a brutal Saturday by anyone's standard. Google shows us the flight option, which at one hour and 20 minutes, looks favourable. Big Sam Allardyce gave fans a thumbs up as he entered the Stadium of Light. He is of course one of few masters out there when it comes to guiding a side away from relegation. But this Sunderland side are rancid. They have just one league win this season and a few draws. Only Bournemouth have a defence which has conceded as many goals. It's a thumbs down so far for sure. Can he keep them up? Tweet me on #bbcfootball and Saints fans, I want to hear about your season too. Hello and welcome to our live text offering of Southampton's trip to Sunderland - my word that's a long journey (more on that in a second). Sunderland, fresh from a 6-2 mauling at Everton, find themselves in the relegation zone - nothing new there. Saints are again achieving and going about their business steadily - nothing new there. We're either going to get Sunderland upsetting the apple cart here or finding themselves deeper in trouble by 17:00 GMT. Should be a decent offering. Stay with me for goals, chances, touch maps, stats, tweets and much more.